a folded convolution capping the posterior extremity of the lateral (sylvian) sulcus; together with the angular gyrus, it forms the inferior parietal lobule. 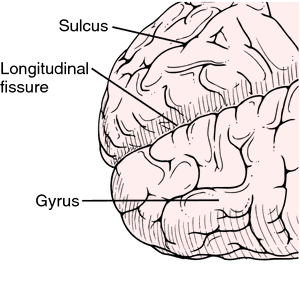 A folded convolution capping the posterior extremity of the lateral (sylvian) sulcus; together with the angular gyrus, it forms the inferior half of the parietal lobe. A V-shaped gyrus capping the posterior end of the Sylvian fissure in the parietal lobe of each cerebral hemisphere, just dorsal to the angular gyrus. The supramarginal gyrus plays a role in auditory comprehension. 24] Recently, this research team  used an automated extraction method (which is more efficient that the ROI method) in patients with OCD and found decreased blood flow in the left inferior temporal lobe, supramarginal gyrus, transverse temporal gyrus, outer dorsal nuclei, outer posterior nucleus, intercalated nucleus, and increased blood flow in the left superior parietal lobule, and the dorsal thalamus. As mentioned, some researchers have interpreted underactivation in the tempoparietal region as an underdeveloped or inefficient posterior reading network involving Wernicke's area, angular gyrus and supramarginal gyrus. Paulesu, Frith and Frackowiak (1996) described a possible memory circuit that includes a phonological store, with the insula and the supramarginal gyrus involved in this circuit. The researchers identified the unique area, called the anterior supramarginal gyrus (aSMG), through experiments in which 47 people and five rhesus monkeys watched videos of simple tools being used while their brains were scanned with fMRI. Earlier pathological and imaging studies have found evidence of early Alzheimer's disease in these three areas - the hippocampus, entorhinal cortex and the supramarginal gyrus.